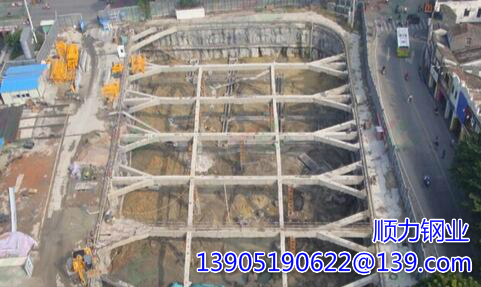 The following is a cold-formed steel sheet piles support structure design process. If the wall deformation and ground subsidence are important for the project, the use of limit state calculation is required. (2) Determine the soil depth of sheet pile wall by means of limit equilibrium method or soil / structure interaction analysis method. (5) For the depth of the wall, calculate the load (wall bending moment, shear force, support or bolt load) in 55 by using the limit equilibrium method or field structure interaction analysis method. (6) Determine the wall deformation and soil displacement (if necessary) by using the 5] 5 soil / structure interaction analysis method, or the engineering experience analogy method. (7) Check whether the 55 load action and the wall deformation and soil displacement calculated in step (6) meet the requirements (ie, whether it meets the allowable stress standard of the steel sheet piles wall). (8) Determine the design bending moment and shear force at the ultimate capacity of the wall, taking the larger of the following two sets of numbers: Moment and shear values ​​calculated in step (3) or (5 ), The resulting bending moment or shear force value x 1.35. Calculating wall bending moment, shear force, support or anchor force (if used) in the SLS state requires consideration of the pressure acting on the wall at the equilibrium condition (F: 10). UIS conditions, the wall should have a deeper embedded depth, equivalent to F> 10. Under the state of use, U-shaped steel sheet piles price calculation of groundwater seepage force should consider the wall of all embedded depth.